Dental Care Bridgewater | Dental Crowns: What Are They Used For? A dental crown looks just like a natural tooth. It is used when a tooth has a cavity or damage that requires either improvement in the size, shape, strength or appearance. 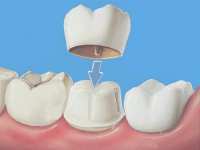 When the crown is cemented into place it fully covers the visible portion of the tooth. If you require a crown the dentists at Dental Care Bridgewater will create a crown that looks and feels as natural as a real tooth. In fact, no one will even know you have a crown.